Catalyst plays a key role in functional fuel cells (FCs). We are developing graphene catalysts, aiming at using ultra-small amount of platinum (Pt) for fuel cells. The Pt catalysts are expected to be loaded on graphene as electrode materials. Graphene is synthesized from graphite by a chemical “wet” method via formation of intermediate graphene oxide (GO). Metal nanoparticles (NPs) such as Pt, gold (Au) and Au-Pt core-shell NPs are produced by green syntheses based on our glucose-starch protocol. The syntheses allow us controllable core size distributions in the range of 8 to 80 nm. Typical Au-Pt core shell NPs are 8 ± 2 nm with atomically thin Pt layers. The properties and functions of the Au-Pt core shell NPs have been characterized using electrochemical, microscopic and spectroscopic techniques. The Au-Pt core-shell NPs are further immobilized on graphene through chemical syntheses to form graphene hybrids, which are investigated in electrochemical systems as catalysts for FC related reactions. 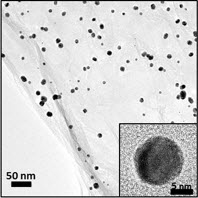 The graphene supported Au-Pt core shell catalysts show good performance with high catalytic activity towards oxygen reduction reactions in 0.1 M HClO4 solution. Results have been compared with the commercial Pt catalysts in the same condition. 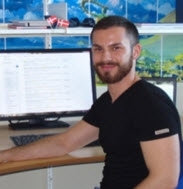 Nedjeljko Seselj is a PhD student (2014-2017) at the Nanochemistry group, Department of Chemistry, Technical University of Denmark (DTU). He is interested in the development of metal and graphene-based nanomaterials, their electrochemical and electrocatalytic properties and the application in energy conversion and storage devices. He has expertise and knowledge on chemical syntheses, electrochemistry such as electrochemical quartz crystal microbalance, chronopotentiometry and -amperometry, cyclic voltammetry, electrochemical impedance spectroscopy, and microscopic techniques such as atomic force microscopy (AFM), transmission electron microscopy (TEM) and scanning tunneling microscopy (STM). His Ph.D project is focused on ‘Chemical Production of Graphene Catalysts for Electrochemical Energy Conversion’. He received his B.Sc. degree in Chemistry and Chemical Engineering at the Faculty of Chemical Engineering and Technology, University of Split, Split, Croatia (2011) where he worked at environmentally benign caffeine-based steel corrosion inhibitors. He continued his M.Sc. degree at the Faculty of Chemical Engineering and Technology, University of Zagreb, Zagreb, Croatia (2013) where he studied the electrochemical properties of carbon nanotube-supported metal oxide supercapacitors. In addition, he started chemical syntheses of graphene and worked with pseudo and supercapacitors.